Concerning new research has revealed just how big an effect your suburb can have on you in later life. POSTCODE prejudice is rampant in Australia. You can always find a Sydneysider who will judge you according to your proximity to the Harbour Bridge. A Melbourne driver's licence that says "Rockbank" or "Broadmeadows" might prompt a side-eye glance from city bouncers. And saying you're from a regional town can spark questions that make you feel like you're a total foreigner. It's a frustration anyone not of the "Harbourside Mansion" flock can probably relate to, but worrying new research has found that your area of upbringing can drastically impact how you progress in later life. The gap between Australia's rich and poor is the widest it's been in over 30 years, and according to a new Children's Geographies report, it's no easy feat for kids to get out of a disadvantaged region. Experts have found a concerning gap between how children from different areas of Australia grow up. UNSW Senior Research Fellow Jennifer Skattebol and Flinders Associate Professor Gerry Redmond found that, while Australia may be a relatively affluent First World nation, child poverty and intergenerational poverty are still concerning under-reported issues. "A significant number of young Australians who grow up in poverty find it difficult to engage with formal education; they leave school early or cannot navigate from education to the world of work," the authors note. Their research, which took place in New South Wales, Victoria and South Australia, found that those in the most disadvantaged communities were not only more likely to live in poverty, but less likely to have access to recreational facilities, sports clubs, libraries and extra-curricular schooling activities. Where children grow up in Australia can have a significant impact on their later life. Researchers found there aren’t enough opportunities afforded to kids in poorer suburbs. "Our findings suggest that young people in the most deprived suburbs experience poverty of opportunity flowing from structural resource shortages and from overt and covert social exclusions that operates in neighbourhood facilities and social networks," the report says. The report noted that families without a lot of money can and do live in affluent areas, just as other families can be well-off living in a disadvantaged area. But according to the research, poor people living in more affluent areas are more likely to do well than those in impoverished areas. Part of this is due to their learning of "soft skills" like conscientiousness, social skills and perseverance through extra-curricular activities that are more likely to be available in more well-off areas. "Parents who recognise the long-term benefits of these activities often invest heavily in their children's participation in them," the authors say. Conversely, poorer areas were often less likely to offer the structures that improve these life skills and enhance job prospects. The report also found social exclusion perpetuated the gap of inequality. Well-off people were less likely to take part in activities they believed accommodated "troubled" kids. 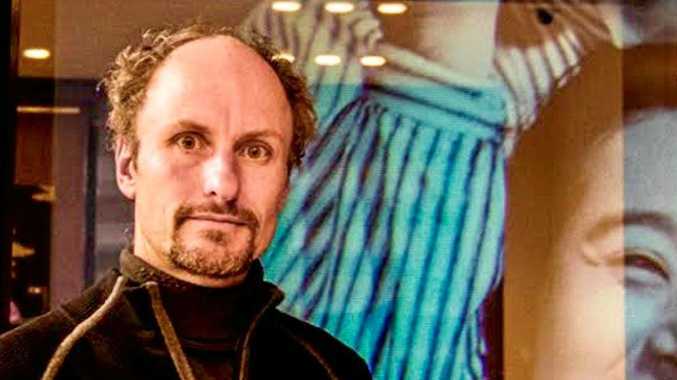 "These comments capture the social exclusion that keeps young people living in disadvantaged suburbs from connecting with young people in more affluent suburbs, or using facilities near them," the authors wrote. Conversely, they found that young people in disadvantaged suburbs were afraid of interacting with those in more affluent suburbs, based on the worry that if there was a conflict, they would be worse-off. In other words, the social isolation comes from both sides. The Dropping Off The Edge research program identifies the most advantaged and disadvantaged areas in each state and territory. The maps show this isn't as simple as assessing the proximity of suburbs from major cities. 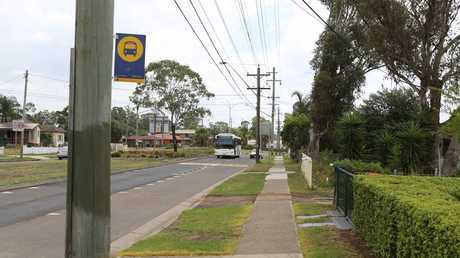 The Sutherland Shire, for example, which ranked as one of metropolitan Sydney's most affluent regions overall, shares a border with Campbelltown and Appin, which are among the city's most disadvantaged areas. 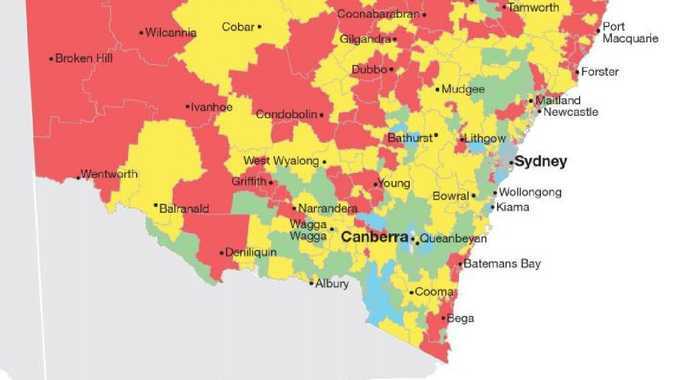 In New South Wales, the most disadvantaged areas were regional, extending from Lismore in the northeast to Broken Hill in the far west, down to Bateman's Bay and Bega in the southeast. 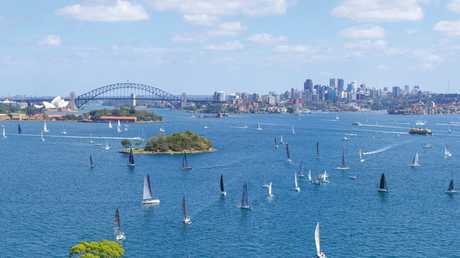 Inner Sydney, Kiama in the south, parts of the Blue Mountains including Wentworth Falls and Blaxland, and the city of Canberra were placed among the state's most advantageous. Within metropolitan Sydney, the inner city, eastern suburbs, North Shore and Hills District were among the most advantaged, as was the Sutherland Shire to the south. Some of the most disadvantaged areas were Campbelltown and Appin in the south, suburbs between Penrith and Blacktown in the Greater West. 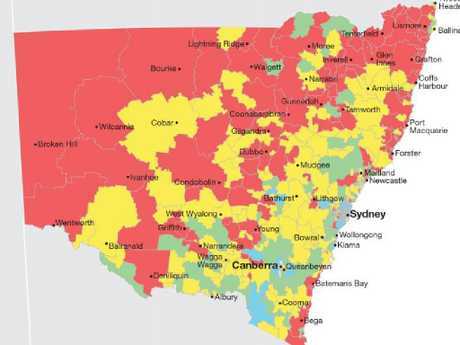 Katoomba in the Blue Mountains and Woy Woy on the central coast were also heavily disadvantaged. A map of NSW. Blue areas represent the ‘most advantaged’ areas, green the ‘advantaged’ areas, yellow ‘disadvantaged’ and red ‘most disadvantaged’. In Victoria, inner Melbourne was predictably among the most advantaged areas, while regional towns including Portland, Hamilton, Red Cliffs, Benalla and Traralgon were among the most disadvantaged. In the metropolitan area, the most advantaged areas included Brighton, Essendon, Macedon, Hurstbridge and Portsea. 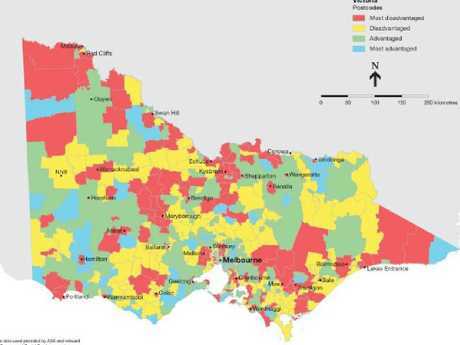 Frankston, Cranbourne, Dandenong, Warburton and Craigieburn were among the most disadvantaged suburbs. In regional Victoria, the disadvantaged areas are spread out, from Red Cliffs in the northwest down to Bainsdale in the southeast. With the exception of the Adelaide CBD and a few smaller sections of the region, much of South Australia's land is considered disadvantaged in terms of income, employment and education. There are some exceptions. Roxby Downs, an outback mining town over 500km north of the Adelaide CBD and home to BHP Billiton's Olympic Dam site, is regarded as one of the state's most advantaged towns, even though the wider region surrounding it was relatively disadvantaged. The towns of Wudinna and Cleve were also among the more well-off. With the exception of the Adelaide CBD and a few small sections of the region, much of South Australia’s land is considered disadvantaged in terms of income, employment and education.